Panama defended in a base 4-5-1-0 shape, with the wingers focused on man-marking England’s wing-backs. This combined with Young and Trippier’s advanced positions meant Panama’s defensive shape often resembled a 6-3-1-0. With no pressure on England’s first line of build-up; Stones, Maguire and Walker were at times slow to adjust their positions after one of them dribbled forwards. This led to some issues when trying to switch across the back line in response to Panama’s ball-near 8 and winger moving up to press. In the early stages this led to one or two unnecessary ball losses, but more generally reduced the speed at which England could switch to escape pressure. However, given the opponents’ 6-3-1-0 defensive shape, the more standout feature of England’s game was their methods of attacking Panama’s deep and wide defensive line. In both of England’s games so far, the key relationships in attack are between the wing-backs and the 8s, against Panama they showed impressive co-ordination and variation in ways to create and attack space behind Panama’s defensive line. When the first pass from England’s build-up diamond (back 3 & Henderson) goes to the wing-back and attracts a presser, the near 8 runs diagonally into the space behind this pressing opponent. This creates the option to play through to them down the line, or potentially opens a lane back into central areas by dragging an opponent wide with them. On most of these occasions, Southgate’s side have played curled passes for the 8s run down the flank, using the athletic abilities of the likes of Alli, Lingard and Loftus-Cheek. A slight variation of this was evident in the move that led to England’s first penalty, with Loftus-Cheek taking the left backs attention, Sterling making a diagonal run taking Panama’s left centre-back with him, and Lingard making a similar run in the centre unmarked. England have also shown methods to access these play into depth from deeper. When one of the build-up diamond players are able to look up towards a flank whilst in possession, this appears to be a trigger for the 8 and wing-back to make their movements. They use opposite movements skilfully to create separation from their opponents. On a few of these occasions, Loftus-Cheek dropped deeper and towards the wing with Trippier simultaneously making a late diagonal run. For such overwhelming underdogs, Panama enjoyed several lengthy spells of possession, although they largely struggled to make this effective. A key reason for Panama’s possession was their focus on playing in the “problem areas” around England’s shape. 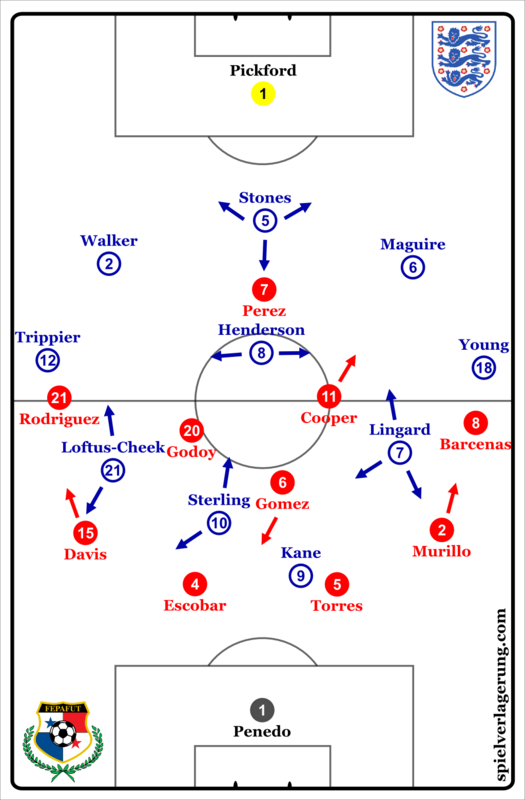 In defensive phases, England started from a 5-3-2 basic shape. In a 5-3-2 the space outside the “3-2” can be difficult to have access to immediately, and Panama focused on using this as the basis to start attacks and switch away from pressure. Panama’s holding midfielder, Gomez, often dropped into the defensive line creating a back 3, whilst the full-backs moved up to the midfield line and were positioned immediately in the problem areas outside England’s shape. The wingers; Rodriguez and Barcenas, stayed high and wide outside England’s wing-backs as Panama moved into a wide 3-4-3 structure. The wingers’ positioning had the effect of pinning Trippier and Young back and preventing them from pressing when Panama’s full-backs were in possession. As such, England used the ball-near 8 to press in these situations, however the distances for the midfield 3 to press from flank to flank was huge, and as a result they were unable to create intense pressure. However, the American side lacked clear ways of creating effective attacks when moving forwards from their full-backs in possession. They often lacked a presence in the near offensive half space to have a more complex/unpredictable group combination. As a result they often played straight lofted balls down the wing, or later on hopeful early crosses, both of which were easy to deal with. Since England’s near 8 was drawn out to the wing, their control of central midfield areas was weakened, a more concerted effort to play diagonally inside and involve the striker (Perez) could have helped create more dangerous attacks. 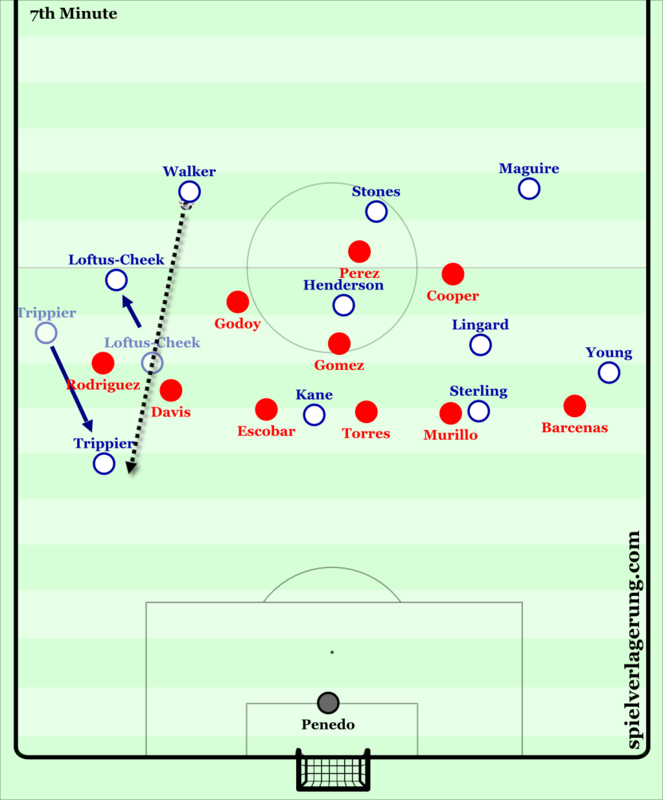 Both of England’s goals against Tunisia came from corners, and in this game a further 2 originated from corners, with a 3rdcoming from a free kick routine. Most of England’s goals and chances thus far have come from set-piece situations, and this game revealed how their planning makes them so dangerous. In all 3 of England’s corners, they showed a very similar movement pattern with the specific aim of clearing the central area of the box for a specific player to attack the ball. 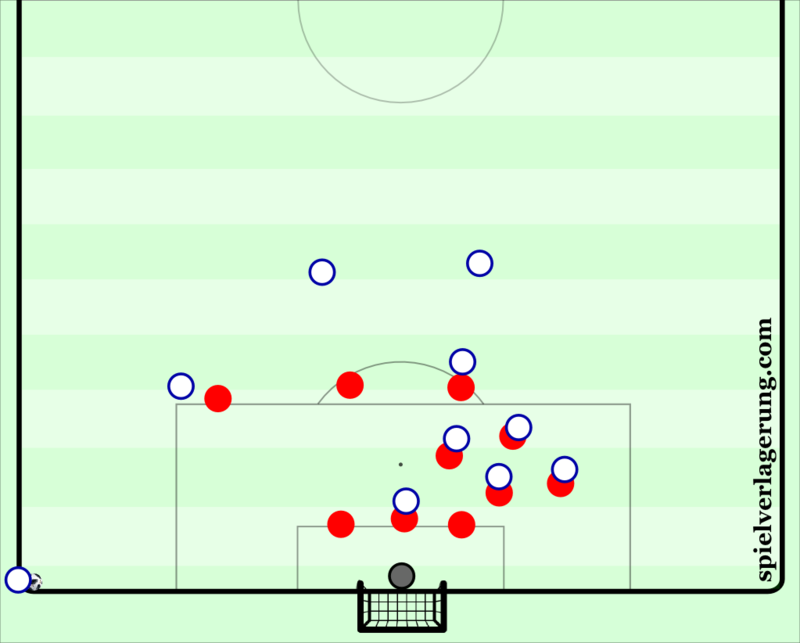 Panama’s set-up was consistent, two zonal markers in central areas on the 6-yard line, 7 man-markers in and around the box, and a zonal player near the top of the box to watch a short option. England’s set-up was also consistent, Lingard hovered around the near edge of the box, threatening to receive a short option and taking an opponent out with him, Walker and Young a few metres behind the box to defend counters/clearances. Sterling would start around the penalty spot, Maguire wide on the far side, Stones on the edge of the box whilst Kane, Henderson and Loftus-Cheek started just inside the box towards the far post. In their first corner of both halves the movement of the in-box attackers was almost identical. Kane and Sterling moved towards the far post, dragging their markers with them, Maguire dropped towards the edge of the box, while Loftus-Cheek and Henderson run towards the near post also taking markers with them. On both of these occasions, the aim to open the centre of the box for Stones to run through and attack was clear. England’s other corner, also had a similar routine, although this time with the aim of clearing the centre for Maguire. From Panama’s initial set-up they looked able to deal with the threats, but the key difference between the first corner which resulted in a goal and the others was a short intervention from the referee to warn against holding during which England adapted their structure. Whilst the referee intervened in the box, Lingard moved closer to the short corner, and his previous marker passed him on to the player tasked with watching short options. At this time, Young moved into the box to remonstrate with the official, so when Lingard’s previous marker looked to assess the situation he was comfortable that there was only one opponent on the edge (Stones) who was already being marked, and thus decided to hold his position. Before the corner was taken, Young returned to the edge of the box and was able to create a 2v1 against Stones’ marker. Young then blocked said opponent slightly, allowing Stones to get free. The other crucial element to this goal was how Panama’s two zonal defenders on the 6-yard line were taken out of the game. The first was taken out by the height of the delivery, whilst the other, Torres, was taken towards the near post by Henderson’s run. As such, Stones had the freedom of the penalty spot to give his side the lead. England’s fourth goal came courtesy of a superbly worked free-kick routine. The free-kick was dead in the centre halfway between the D and the centre circle. England had an evenly distributed front line with Kane, Loftus-Cheek and Maguire on one side and Henderson, Lingard and Stones on the other. Sterling meanwhile, started right in the centre on the edge of the box. Henderson made his dropping movement from the left edge of the box late and with speed, giving him the separation to play his cross first time. Kane on the far side was able to lose his marker due to superior timing and body positioning (advantages of knowing the routine), whilst his marker struggled to balance watching him and the movement of the ball. Sterling was able to get free in the centre due to the routine as a whole. The short pass to Henderson encouraged Panama’s central defenders to hold their position, then the far post cross led to ball-watching and forgetting to recover towards the 6-yard line early enough. Stones was able to get free for the same reason, and finish the rebound from Sterling’s effort. As opposed to the blockers and diversion movements at corners, this routine worked due to perceptually overloading the Panama defenders. The result saw England qualify for the knockout stages before their clash with Belgium, whilst Panama are out. Moving forward Southgate may be concerned at how easily Panama were able to pin England into a back 5 with high and wide wingers, and then control the spaces either side of their midfield. Opponents with greater quality may be able to create more issues for his side from such positions. Meanwhile, it will be interesting to see how much variation England come up with in set-piece situations for their remaining games.